Is there anything more universal than food? It's ability to bring us together, it's an experience we all share, and it's truly wall breaking. 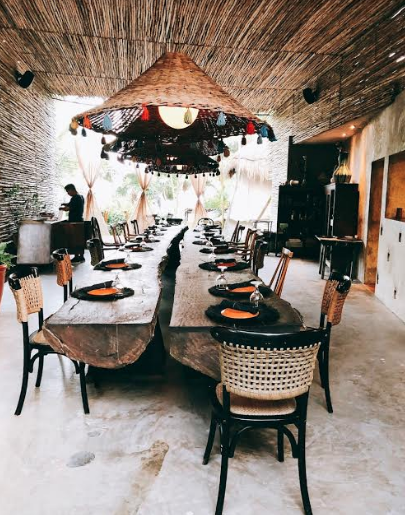 The food scene in Tulum is absolutely unreal, the fresh quality of every plate, the tradition, the imagination, the pure smell of food that lingers through the beach proper, inviting you in while inspiring you at the same time. Located at the ocean side hotel Sanara (which literally means to heal) this restaurant was born out of a desire to provide sustainable food for digestive well being. I'm all about digestive well being. The menu is nutritious and delicious! Get the Activated Turmeric Latte and the Macho Pancakes, made from plantain floor.... yes they taste like heaven. Here's the best part you can get a sneak peek to these pancakes because the recipe is online! When you walk into the Posada Margherita you truly are transported to an Italian villa. This gorgeous little spot a little ways down the road from the main beach, and is way too cute to pass up. Now the Posada is known on the beach as the place to get pasta, and it's really amazing pasta...I've had it. But I liked the breakfast so much more. Get the fresh spicy pineapple juice and the Eggs in a Basket. The breakfast at Posada is just down to earth good. The first time I went to Tulum this place wasn't real yet....oh my lord did this place need to exist. 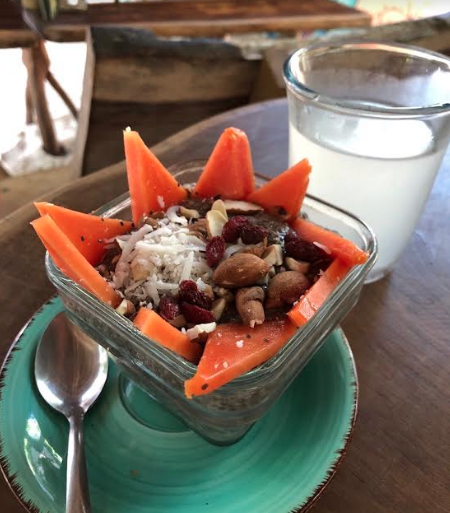 Nestled in the heart of the Ahau among the sand this perfect little cafe is the right place to pick up an Acai bowl, smoothie, chia pudding, or raw pizza! I loved this place so much it was the only place I went multiple times during my trip. All of the food was super fresh and nourishing! Get the Chia Pudding with Papaya or the Healthy Belly smoothie. Ok... You know when a place photographs beautifully but isn't the best? Well hate to be bearer of bad news but this is one of those places. I make Acai bowls for a living and I was so excited when I heard about this place... but I was left with not the best impression. Here's the thing... yes it's cute and it'll photograph beautifully but for what they're charging and what they're actually serving it's not worth the price. First they put agave in their smoothies, agave isn't healthy, second the ingredients we're meh. Yes it was tasty but not in a way I felt good after. If I lived in Tulum I would eat at the Hornio everyday. This literal taco stand in Tulum Pueblo is the most affordably delicious meal you will ever have. Maybe costing 5 bucks these tacos are everything you've ever dreamed tacos of being. They are simple and yet the most delicious tacos I've ever had.... it's as real as it can get. 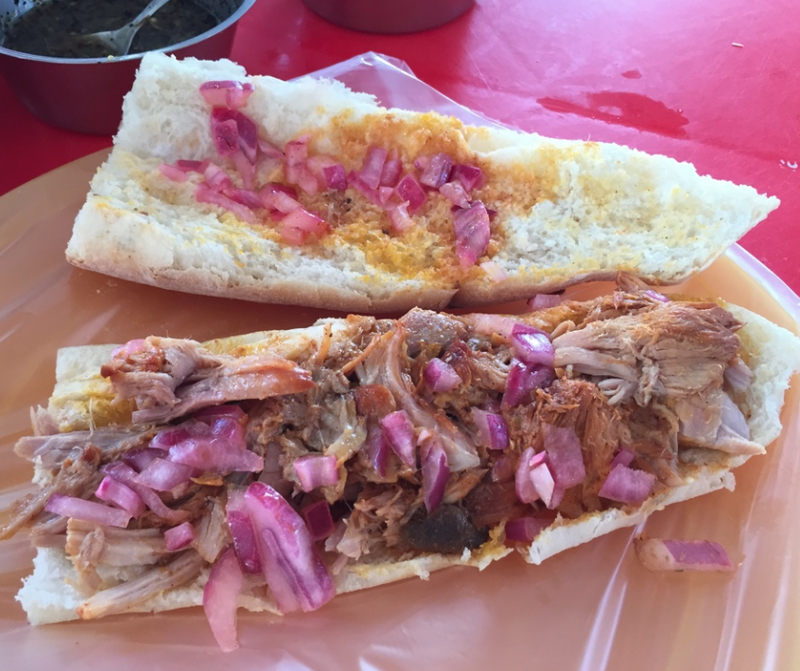 They also make the best tortas (sandwiches) ever.... It's really hard to suggest any of them because everything on this menu is worth getting. Cheap tacos, check. Cheap cerveza, check. Sun, check. The party on the main beach is at La Eufemia. This place, which used to be at a different spot exploded from the last time I was in town to triple it's size with a cool new stand alone location. This place isn't pretentious and is is exactly the place where you can just chill with a bunch of strangers while downing tacos, margs, and ocean views. When you go during happy hour which happens to be after 8 you can get 2 margs for the price of 1 on the fancy drinks. GET the fried fish taco.... yes I said fried and the spicy margarita. Thank me later. What is the best meal you've ever had.... then multiply it by 1000 and that is what eating at the Hartwood is like. When planning a trip to Tulum the first thing you need to do is get a reservation for this oasis in the jungle, it is actually booked for months and the only way to get in is to get there hella early and sit at the bar. The food at the Hartwood is out of this world, every bite is an explosion of flavor and every drink tastes so sweet when it hits your lips. You will have dreams of this meal for the rest of your life....I promise you this. Get the Pulpo and roasted beet with any of their delicious dranks! I spoke about Macando in my last post but didn't go into why it's so special. 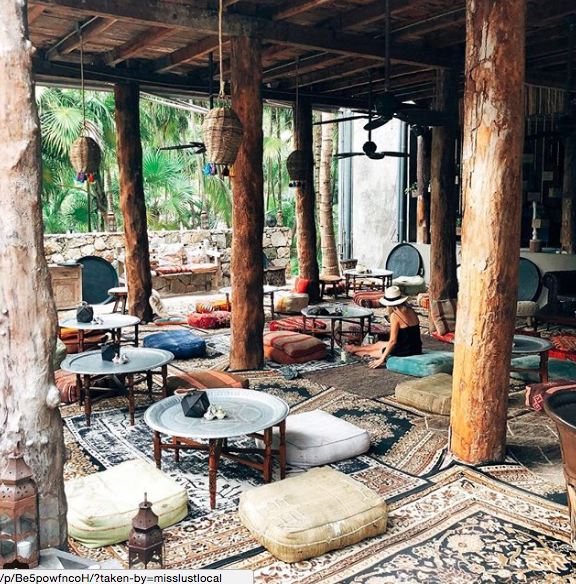 This holistic organic restaurant is housed inside of the Nomade Tulum. The Nomade alone is an experience in well being. A hotel that actually has a tranquility tent of course we have a thoughtfully mapped out menu that is "prepared with the intention to heal from the heart and nurture your soul." I will say this the menu at Macando is well curated and doesn't leave you feeling like blah. Get the salad with chicken added on. Right down the road from my hotel on the jungle side sits Safari. A newer establishment since my last visit this cool taco place is a quiet and dreamy place to sit and have tacos. The menu was simple and the guac was ridiculously delicious.... it also came with Jicama sticks for dipping which I didn't realize I was missing out on. This place was good, not my favorite tacos in Tulum but a nice scene with good food. Get the Guac.... b/c Oh My Gosh. 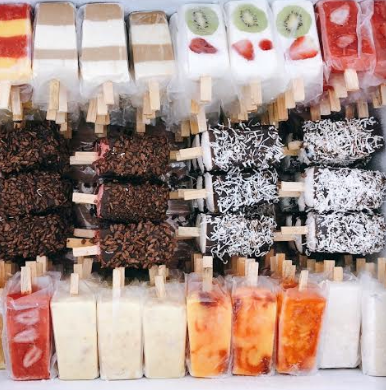 When it comes to dessert this is the perfect place for a hand dipped paleta. The perfect little cafe with the assortment of paletas you can only dream of outside of Mexico. 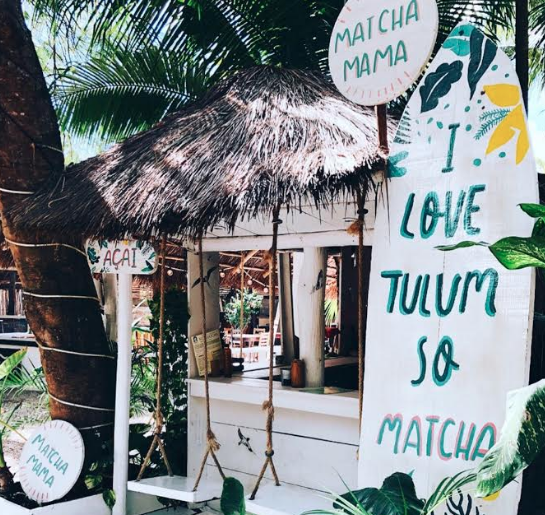 Have you been to Tulum? Where do you like to eat when you're there? I’ve been taking myself on little dates lately. Mainly before yoga or late in the morning into the early afternoon. It’s helping me slow down, take it easy and embrace myself and check in with me. Truth is I used to hate spending time alone, I found it like bidding my actual time and I didn't like feeling "alone".. now though I relish the down "lonely" 'time. Things I’ve been doing on these little dates? Trying new coffee shops, catching up on non wellness podcasts...like S TOWN...omg. And actually reading for fun. What do you do for yourself to check in with yourself?